What did you notice when you arrived at ISP? Throughout my entire life, I've been really into projects and building new stuff. During high school, I was spending all my free time working on projects that, in spite of my passion for them, I couldn’t incorporate to my school life. When I got to ISP I quickly realized that I could bring the things I was doing in my free time and, that way, I could potentially have an impact on other people and the larger community. Before, I used to feel isolated, but I feel that here I have a much broader perspective. There is a cultural understanding here that innovation can make the world a better place. Teachers and staff are always pushing us to keep innovating. It’s the first time that I belong to an academic environment where my ideas are not criticized from the outset and innovation from the students is not suffocated. At ISP we explore, do experiments, and there is a great share of the student body that is into technology. This leads to a variety of people to work with and over time led to the construction of spaces like the tech lab and performing arts center where you have a mini-hub around a certain passion. To put it in other words, there is a great ecosystem here at ISP. The way I see ISP is many things working together, you see people going to athletics competitions but also robotics competitions, so it's unavoidable to have these initiatives. Why do you think collaboration is so important for innovation? Collaboration is 100% essential. After all, we are making things for people, so not involving them in any part of the process does not make much sense. Having a community to test your idea, to discuss different points of view, is an enormous advantage. I for one am very pleased by the level of feedback I have received and how far I have been able to progress. I am quite sure that something like the Near Space Program (NSP) wouldn't have necessarily worked somewhere else, or in the absence of that culture of innovation and collaboration. It really does makes a difference. Collaboration is a great tool, the good thing is that you have the idea of thinking critically about different aspects of the project that might be invisible to a single individual. I noticed that when I was working on my projects individually it was really hard to have feedback, to know what to focus on, etc. and see if it would work. The way I see it, ISP is a small scale of the real world. The diversity and variety of ideas and people in the school; being able to test my ideas in this type of environment is a huge benefit. In that sense ISP provides many resources from using the product to the aspect of making it, that diversity pays off because you can always talk to others. There are enough people here to pull off some interesting initiatives that I would certainly not be able to do on my own. The idea of having friends and actually having fun with other people and the idea of trying to make the world a better place together is cool. I have much more fun when working with others. And working on stuff that's meaningful and having fun it’s a great experience. What have you most enjoyed in your journey so far? I tried doing something like the Near Space Program (NSP) where I was before but it was very hard to get enough support. NSP requires a lot more than just a quick fix. The cool thing is that there is such ambition here and the people like Mr. Rios, who have a hunger and willingness to keep pushing the boundaries even when we fail. I think that this allows me to turn education into much more than a curriculum based experience, but instead school became a place where I had a great opportunity to do something that makes me happy and tackling big and rewarding challenges. I’m glad for having been able to explore my creativity working by working with cutting edge technology which I could find at the school. Plus, I think the work and risks we took paid off, since we were able to break 2 international records for the highest altitude reached in Central America and the Caribbean by a high altitude balloon. You are featured on the cover of Analytics Insight Magazine this month. What has that experience been like? Here at ISP, I presented a satellite data logger, to gather data in real time and send it to satellites and another system that pulls and analyses the data in real time. That way there is a flow of information going on gathering data from sensors and seeing it real time despite being thousands of kilometers from the device. This was for NSP we were using the radio signals but it didn’t really work because mountains block the signals so satellites were the way to go. We kept on iterating until we were analyzing AI trying to make predictions. This is what I presented at the science fair and now I’m going to the AASCA science fair. Also won last year for a similar system but for radio. This shows the evolution of the project. The first time it didn’t work exactly how we wanted but I think we made the right decision in taking the risk. Move fast and break things is an accurate statement. The reason I got featured in this magazine is because during the US 2016 elections I became worried of the fake news problem and I was trying to see how I could use technology to contribute to validating information online. I thought using AI might not be explored enough so I set out to develop an ecosystem around citizens publishing information so removing the middleman in news and using AI to validate information. So I developed TOTAL STORIES http://www.totalstories.com/ in late 2016 and I’ve worked on it for 3 years now. Right now there are users from more than 45 countries on the network and more than 100 newspapers actively writing articles for the platform. This is why the magazine contacted me. 600,000 readers 2 million a month. 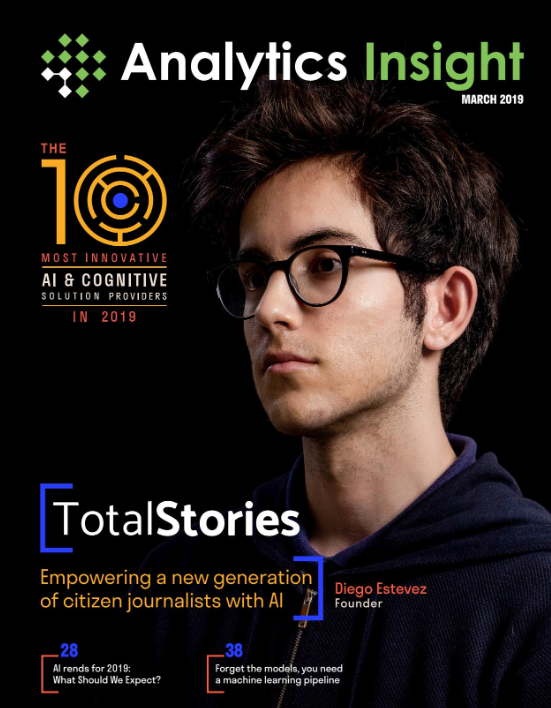 They wanted to feature me on the cover as one of the top 10 most innovative AI companies in the world. At the end of the day when I came up with this idea, I thought to myself, even if I take the risk and this doesn't work, it is still worth it. Using AI to fight fake news, that is. My hope is that someone might even been inspired by what I did and make it even better in the future. Want to read the whole article? Click the link below. I want to take a gap year to work on my projects and to intern at a couple of startups mostly in Silicon Valley. My plan is to work for a year as a programmer while simultaneously developing my own projects. After that, I can give college/university some thought. I’m not 100% sure I want to go, however, because I don't want to drop out halfway through it in order to pursue an idea or company project. Therefore, I think it’s vital that I’m sure that I will the whole 4 years and that I'll be willing to give up the projects, given that it will be unavoidable to have to focus only on school. This is my dilemma at the moment, but overall I think that starting university right away may not be the right choice. I really want to take some time off to discover myself make sure this is what I want to do with my life and, if it doesn’t work out, I can always start school with even more experience about the real world. Thus, taking a gap year seems like the right thing to do. I have been very supported by my mother, who made it seem like the sky was the limit. In the short run it might not seem like it, but giving this a try and not following the status quo, to instead focus on what is the most beneficial in the long run, just might be worth it. In the end, I think that that is the best way to fulfill the dreams I had as a child.